you have to have a skills assessment. The former is not likely to present a problem, since you are applying from within Australia, though you may have to sit again for the IELTS Test if you took the test more than 2 years ago. If you do, you should register for the IELTS well before you start planning your visa application. The timing and the results of the IELTS test are entirely within your control. The Skills Assessment, on the other hand, does create some uncertainty: it is usually the first stage of the visa aplication process and as such the outcome cannot be predicted. In the vast majority of cases, however, if you have scored 65 points on the Points Test and as long as your application follows the rules and the supporting documentation is perfect, it is unlikely that your skills assessment will be negative. In the unlikely event that this should happen, most Assessment Authorities allow an application to be submitted more than once. you can be sponsored by an Eligible Relative You or your partner must be related to your sponsor as a non-dependent child (including a stepchild),a parent (including a step parent), a brother or sister (including a step-sibling), a niece or nephew (including a step niece or nephew) or an aunt or uncle (including a step aunt or uncle). you must sign an Australian Values Statement.This statement is included in your visa application form and all applicants aged 18 years and over will need to sign it to confirm that they will respect the Australian way of life and obey Australian laws. 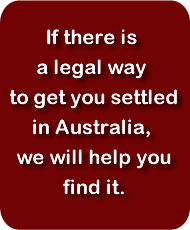 Before signing this statement you are required to have read, or had explained to you, material made available by the government on life in Australia which is contained in the Life in Australia book.